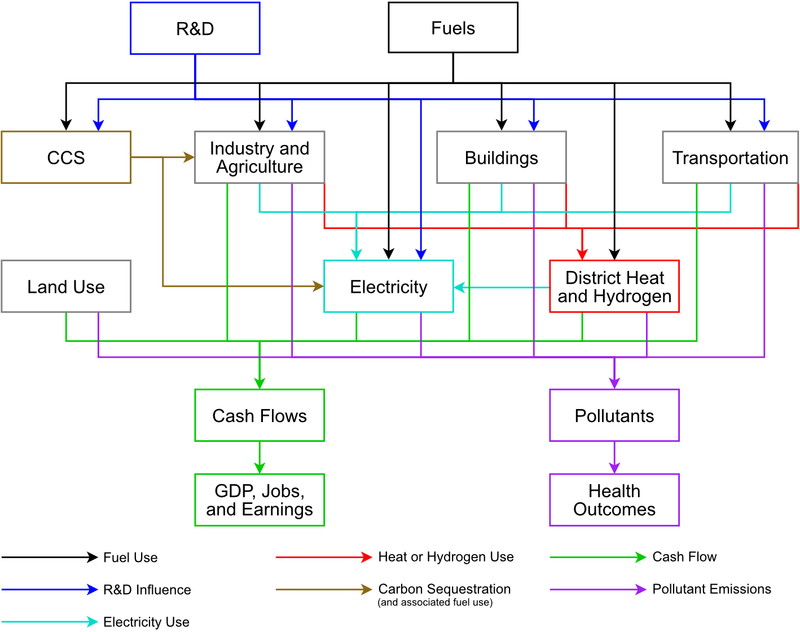 The Energy Policy Simulator (EPS) is a system dynamics model that assesses the effects of 58 energy and environmental policies on a variety of metrics, including the emissions of 12 pollutants; cash flow changes for government, industry, and consumers; the composition of the electricity generation fleet; the usage of various fuels; and social benefits from avoided public health impacts and climate damages. The model is designed to operate at national scale. It includes five major sectors: transportation, electricity supply, buildings, industry (including agriculture), and land use/forestry, each of which contains many variables and a variety of policies. It also has a number of other components that cover additional emissions sources or sinks, or which give the model additional capabilities. These include district heating, carbon capture and sequestration, research and development, fuels, and a variety of useful output metrics. The model reports outputs at annual intervals with an initial year of 2015 and a final year of 2030. A customizable policy implementation schedule allows for policies to be phased in with any given level of stringency in any particular year, as desired by the user. There exist a variety of approaches to representing the economy and the energy system in a computer simulation. The EPS is based on a theoretical framework called “system dynamics.” As the name suggests, this approach views the processes of energy use and the economy as an open, ever-changing, non-equilibrium system. This may be contrasted with approaches such as computable general equilibrium (CGE) models, which regard the economy as an equilibrium system subject to exogenous shocks, or disaggregated technology-based models, which focus on the potential efficiency gains or emissions reductions that could be achieved by upgrading specific types of equipment. System dynamics models often include “stocks,” or variables whose value is remembered from timestep to timestep, and which are affected by “flows” into and out of these variables. The EPS uses stocks for two purposes: tracking quantities that grow or shrink over time (such as the total solar electricity generation capacity) and tracking differences from the BAU input data that tend to grow over the course of the model run (for instance, the cumulative differences in the potential fuel consumption of the light-duty vehicle fleet caused by enabled policies). The model’s structure can be thought of as occurring along two dimensions: visible structure that pertains to the equations that define relationships between variables (viewable as a flowchart in Vensim) and behind-the-scenes structure that consists of arrays and their elements, which contain data and are acted on by the equations. For example, the transportation sector’s visible structure consists of policies (such as a fuel economy standard), input data (such as the BAU cargo distance traveled- that is, passenger-miles or freight ton-miles), and calculated values, such as the quantities of fuels used by the vehicle fleet. The arrays in the behind-the-scenes structure of the transportation sector consist of vehicle categories (light-duty vehicles (LDVs), heavy-duty vehicles (HDVs), aircraft, rail, ships, and motorbikes), cargo types (passengers or freight), and fuel types (petroleum gasoline, petroleum diesel, electricity, etc.). The model generally will perform a separate set of calculations, based on a separate set of input data, for every combination of array elements. For example, the model will calculate different fuel economies for passenger HDVs, freight HDVs, passenger aircraft, freight aircraft, and so forth. In Vensim, an array variable is called a “subscripted variable,” a single dimension of an array is called a “subscript,” and the possible values an array dimension may take are called “subscript elements.” For example, the variable called “Fleet Aggregate Fuel Use[vehicle type, cargo type]” is a subscripted variable, “vehicle type” and “cargo type” are each subscripts, and the “vehicle type” subscript has the elements “LDVs,” “HDVs,” “aircraft,” “rail,” “ships,” and “motorbikes.” Almost every variable in the EPS is subscripted. The following diagram shows the major pieces of the model, and the arrows denote the order of calculation, not the flow of energy. For example, the amount of electricity required is calculated in the demand sectors (Industry, Buildings, and Transportation), and then this result is fed into the Electricity Sector, which determines how to generate the necessary quantity of electricity. The model’s calculation logic begins with the Fuels sheet, where basic properties of all fuels are set and policies that affect the price of fuels are applied. Information about the fuels is used in the three “demand sectors”: transportation, buildings, and industry (including agriculture). These sectors calculate their own emissions from direct fuel use- e.g. fossil fuels burned in vehicles, buildings, and industrial facilities. These sectors also specify a quantity of electricity or heat (energy carriers supplied by other parts of the model) required in each year. The electricity and district heat sectors consume fuel to supply the energy needs of the three demand sectors. The model also has a land use, land use change, and forestry (LULUCF) sector, which handles the emissions of pollutants and the sequestration of CO2 from existing forests, afforestation/reforestation, deforestation and timber harvesting, etc. All of these sectors produce emissions of each pollutant, which are summed at the end. The same is true for cash flow impacts, which are calculated separately for particular actors (government, industry, consumers, and several specific industries). Calculation of changes in spending (for example, on capital equipment, fuel, and O&M), as well as social benefits from avoided public health impacts and climate damages, are also carried out at this stage. There are two model components that affect the operation of various sectors. A set of R&D levers allows the user to specify improvements in fuel economy and decreases in capital cost for technologies in the sectors (except LULUCF) and in the carbon capture and sequestration (CCS) module. The CCS module alters the Industry and Electricity sectors by reducing their CO2 emissions (representing sequestration), increasing their fuel usage (to power the energy-intensive CCS process), and affecting their cash flows. Lastly, there are a number of sections that are not part of the model’s calculation flow but serve other purposes. The “Policy Control Center” is a sheet where the user can conveniently view and set all of the policy levers. The “Cumulators,” “Cost Outputs,” and “Additional Outputs” sheets perform calculations on the results from the sectors and provide outputs of interest. A Web Application Support Variables” sheet converts many outputs of interest to more commonly-used units (for example, converting BTUs of natural gas to trillion cubic feet of natural gas), so that these variables may be referenced by the web application that powers the online version of the EPS. A “Debugging Assistance” sheet provides the means to easily check certain totals that should sum to zero in the absence of bugs.